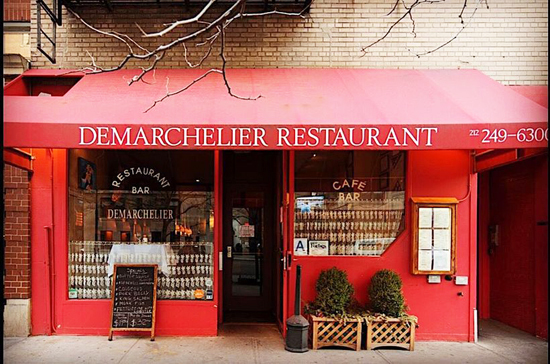 Any resident who has lived in or around Manhattan for longer than a New York minute has passed by Demarchelier Restaurant on East 86th Street. Located on the south side of the street, this establishment is firmly planted near Central Park, The Met and various Embassies – it’s a tiny but mighty café with a fire engine red facade and lace curtains – the exterior captures tradition and old-world charm while the interior is vintage and casual as well as a time warp. Stepping inside is like walking into the halcyon days of Monte Marte. The observant will notice immediately that the walls are accented with Eric Demarchelier’s rotating paintings. 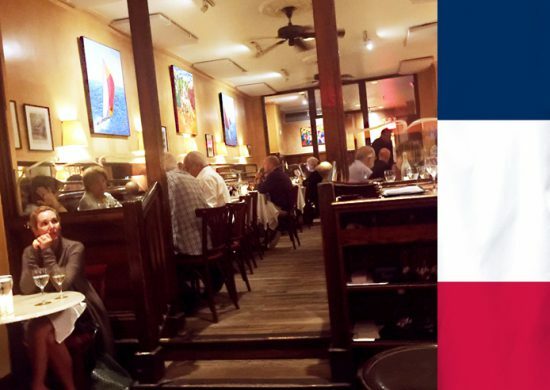 The family is celebrating 25 years of authentic French cuisine plus creativity. You will more than likely be greeted by Emily Demarchelier the daughter of Eric and niece of famed, fashion photographer Patrick Demarchelier. The dining area near the bar is comfortable and timeless whilst capturing the spirit of a hidden café in Le Marais. 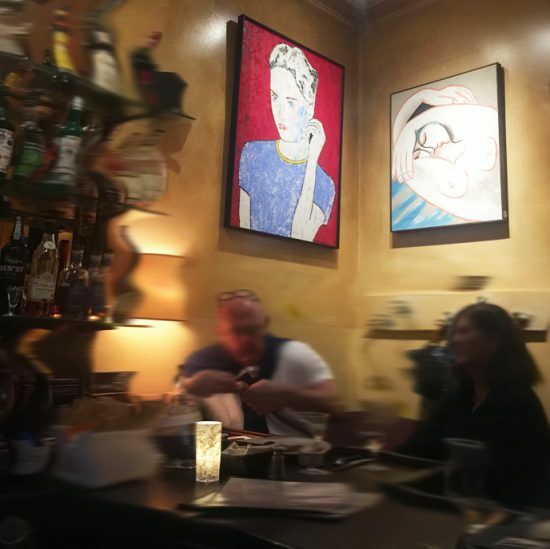 The dining room in the back of the restaurant is a little more formal with Eric’s paintings suspended above the banquette — the compositions of the female form, abstract and expressionism offer a nod and a wink to some of the masters. Appetizers include many traditional starters from the red, white and bleu country including: Pate, Steak Tartar and Organic Beet Salad with crème fresh. You may want to indulge with the Helix Escargot (above). 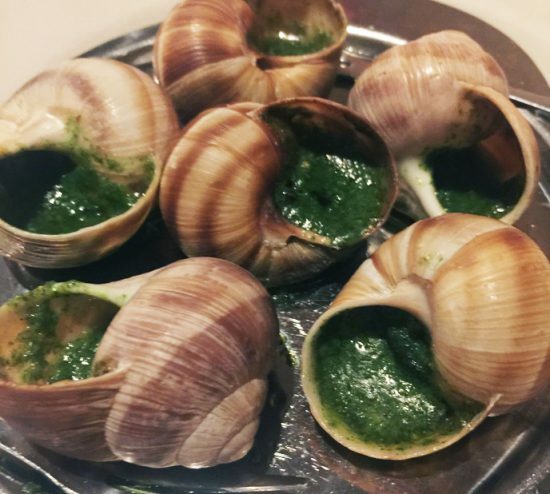 In French cooking, the snails are removed from their shells, and cooked with garlic butter, chicken stock and wine and then placed back into the shells with the butter and sauce of garlic and parsley. This appetizer comes with plenty of bread to sop-up the delicious sauce. Note: The apparatus to hold the shell can be slippery and cause a date night malfunction. 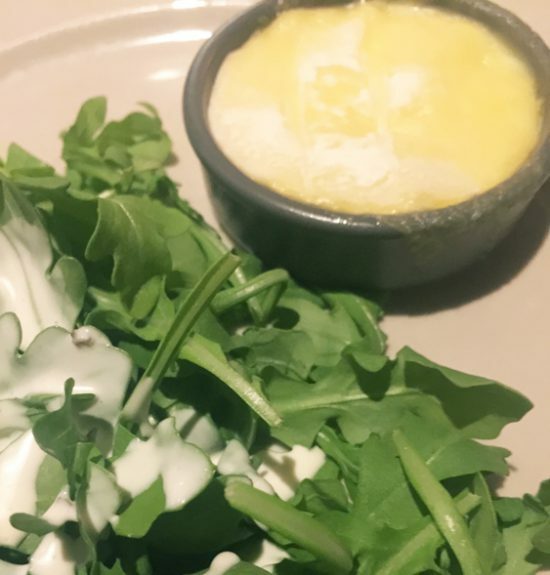 You may also want to try the ½ portion of Cheese Fondu with its decadent blend of fromage – it has a touch of inspiration from neighboring Switzerland. There is a side of organic greens and a creamy dressing. Delicious! The dinner menu offers a wide range of options for every taste. Their Mussels in White Wine, Duck Confit and Pan-fried Sole are very popular. 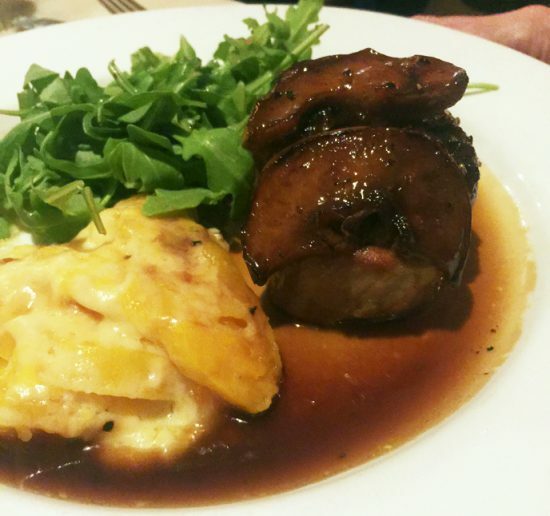 For the fall and winter months, you may want to try their Filet Mignon or the Organic Pork Chop (above) served with caramelized onions, apple and butternut squash gratin. This is a hearty dish to warm the heart and soul. It’s one of the best, bistro plates for the season. The celebration of Demarchelier Restaurant and their ¼ century anniversary continues through the winter with specials of the day. For example, they offer Bouillabaisse (Seafood Stew) on Fridays and Pot au Feu (Beef Stew) on Saturdays. You may want to make a venture to this maison on the UES on a Tuesday. 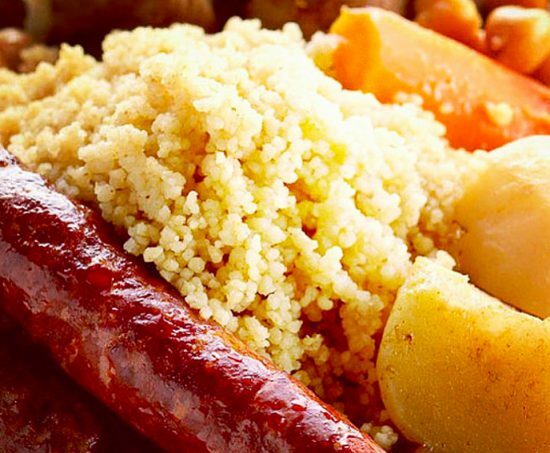 The Cous Cous (above) is a robust stew that was brought to France by the people of Africa – most specifically Morocco. This savory stew with succulent meats will make your taste buds dance from the combination of roasted chicken, spicy sausage, tender beef and assortment of root vegetables. The dish involves a little work as you pour the broth over the pot roast and add the cous cous. Hint: It’s plenty to share between two people but I took ½ home for the next day. This dish reminded me of the first time that I tasted it in a small mom & pop bistro catering to the bourgeoisie near Giverny. The flavors truly conjured up fond memories. Upon leaving the bistro, sated and content, rain poured down from the heavens and created a fountain if not a watershed on the restaurant awning, I couldn’t help but notice the other patrons hunkering down at the bar sipping a digestif or coffee and dessert. It truly felt like exiting a rare work of art. Photo Credits: P.K. Greenfield and B. Ortman. Live Well. Do Good. Look Gorgeous.